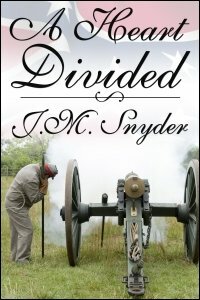 Confederate Lieutenant Anderson Blanks has grown weary of the War Between the States. He is all too aware of the tenuous thread that ties him to this earth — as he writes a letter home to his sister, he realizes he may be among the dead by the time she receives the missive. His melancholy mood is shared by other soldiers in the campsite; in the cool Virginia night, the pickets claim to hear ghosts in the woods, and their own talk spooks them. Then the war broke out, and Andy had enlisted in the Confederate Army to help ease the financial burden at home. Apparently Sam had similar ideas — he now wears the blue coat of a Union solider. Sam is severely wounded and infection has begun to set in. Andy can’t sneak him into his own camp for treatment because all Union soldiers are taken prisoner. But Andy’s Confederate uniform prevents him from seeking help from the nearby Union camp, as well. It’s up to Andy to tend his lover’s wound and get Sam the help he needs before it’s too late … and before Andy’s compatriots discover Sam’s presence. BookWenches: 4.25 out of 5. "A moving story of love, hope, and duty that will capture your attention and make you wish for a happy ending for everybody involved." "Once again, Snyder has penned a cleanly written story with engaging characters and a descriptive setting, injecting intensity and emotion into the prose." "Poignant, sensitive and suspenseful, A Heart Divided will touch your emotions as you watch these two work against time to save their future ... another excellent story by J.M. Snyder." The Romance Studio: 5 out of 5. "This book is more than a romance. It's one of those tales that may help people take a fresh look at history the way Snyder tells it through her characters."